Key Biscayne Florida has blue water and white quartz sand that both sparkles and sizzles in the sun. Seems to be saying, "come hither". Great place to visit and play as this area has a myriad of water sports and activities for the whole gang. 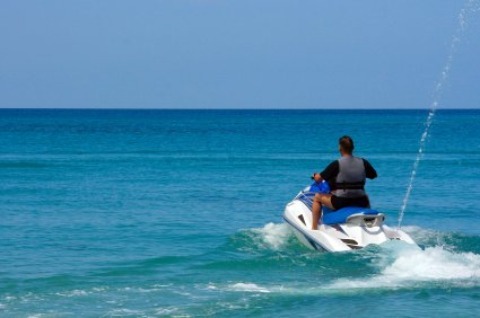 For instance, have you ever wanted to climb aboard a jet ski and soar off to explore the area? Like Speed? Rent a Jet Ski! Key Biscayne, located on the Miami Beach barrier island at the southernmost tip, is both upscale and at the same time, offers a calm and quiet alternative to its ritzy neighbors. But, who are these people who frequent this area? The character of Key Biscayne Florida is two-fold. You have the partying ‘movers and shakers’ who are here to get the job done and a group who look like they belong to the world of movers and shakers but have left business back home and brought only their laid-back, casual attitudes. We strongly suspect that back at the hotel, the latter group unpacks a different attitude to wear for the nightlife. You won’t find as much partying and going wild here as in other Miami beaches, but you will find a lot of smooth sailing, fishing and other relaxing water sports that further define this beautiful island as a tropical hideaway. If you’re looking to pamper yourself a little while you enjoy a beautiful beach with a lot of tourist appeal, this place is definitely for you. See the historical lighthouse that made Bill Baggs Cape Florida State Park famous and enjoy some of nature’s serene beauty while you stroll along the beautiful beach and nature trails. Mix up the way you take beach tours at Splash Academy, where you can take an exciting tour of Key Biscayne and more of Miami’s finest on your very own Jet Ski. Fish for sharks (if you dare!) and fish or take a tour at Florida Native Charters. Spend some time on Miami Beach, just to see and be seen. Hang out with the celebrities. Kids of most ages: Find whatever it is that you and the kids want to play with at Sailboards Miami Water Sports. Eating: With flavors that make your tongue do a little dance, you have to try Tango Grill or enjoy a romantic meal with your sweetheart at The Lighthouse Café. Sleeping: Feel classy and elegant at the Ritz-Carlton Key Biscayne or relax and unwind at Silver Sands Beach Resort.